Two governments have decided to take matters into their own hands by purchasing dredges and using government staff to get the work completed. 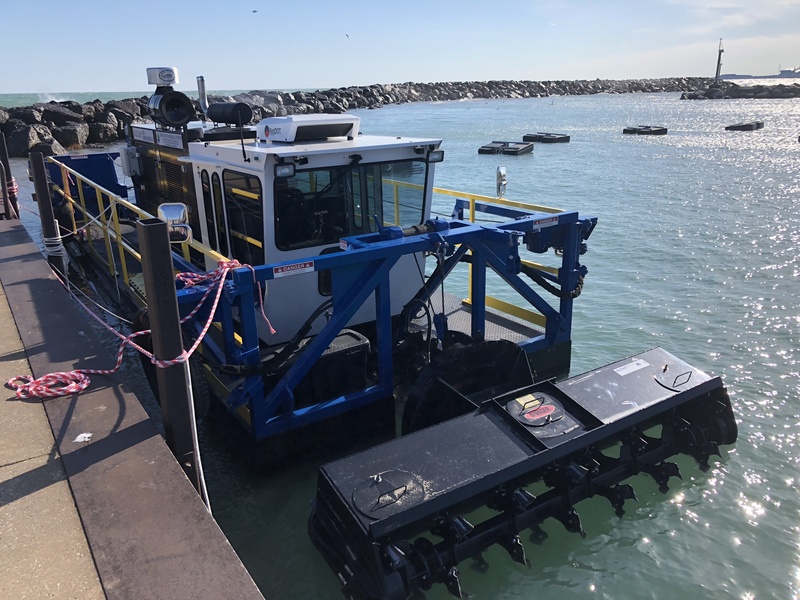 Both the City of Whiting, Indiana, and the Illinois Department of Natural Resources (IDNR) purchased Ellicott Dredge Technologies (EDT) 2019 IMS Model 5012 LP Versi-Dredge systems to complete dredging projects at their boat ramps, marinas, channels and harbors. The dredge is more than 42 feet long and 11 feet wide, so it is small enough to easily store and use. It floats on two pontoons, has a draft of 30 inches and can dredge to 22 feet, or 28 feet with optional extensions. The smaller size appeals to projects that are only looking to clear out specific harbors, channels or boat basins on an as needed basis. “The IMS starwheel drive self-propulsion system allows the dredge to operate without cables that can restrict boat traffic. Its high maneuverability won’t damage docks or other features, like underwater anchors. You can pull into a dock and dredge to a 22-foot depth without having to move the dock,” Ryan Horton, vice president of auger dredge sales at Ellicott Dredge Technologies said. IDNR purchased the dredge to revive its dredging program. It took delivery of the dredge in March, and will begin dredging after its training with EDT. Dale Brockamp, division manager for IDNR Architecture and Engineering, said the state has been a bit negligent over the past ten years in letting the dredging program fall behind. The agency traded in its two old dredges for the new EDT model, which Brockamp said was particularly appealing because they could purchase a custom-made trailer with it so the dredge could easily be launched from a boat ramp. The trailering-launching-recovery (T-L-R) system was designed by Landoll Corporation for easy launch and retrieval. “The trailer allows for easy movement from jobsite to jobsite without using a crane saving operational expenses. There’s no need to hire out a crane. It’s a very unique system designed with a winch system and keel guides on the deck of the trailer and hydraulic rollers to easily move the dredge off trailer to ramp,” Horton said. Illinois owns and oversees close to 150 sites statewide, such as harbors, boat launches and several marinas. The frequent mid-west flooding brings sediment and siltation deposits into these areas so the state needs to come in to keep navigation safe and open. “We do dredge the marinas since we are the owners and we lease out the operations. Our first dredging project will be at the Golconda Marina on the Ohio River. It has 150 slips so it’s one of our larger operations. EDT will be sending down people to the marina to train our crews on the dredge operations,” Brockamp said. Prior to that training, Illinois will also be sending two people from its heavy equipment crew to EDT headquarters for training. According to Brockamp, training is going to be essential as most of the crews have never operated a dredge or worked on dredging projects. 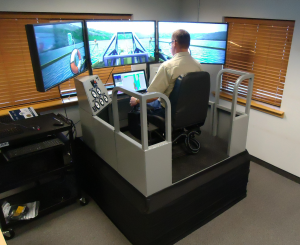 Staff from the Illinois Department of Natural Resources will train on EDT’s dredging simulator. “We send out factory service techs to go on site for three days and do classroom training and then go out and train on the dredge. They go over safety, operations, maintenance and dredging techniques. When they come to the factory, guys are trained on our dredge simulator, where they learn to operate the dredge without the risk of doing any damage. We have the only dredge simulator for a horizontal auger cutter dredge in the world,” Horton said. The state typically dredges in the winter months when the ground is too frozen for other earthwork projects; however, the new IMS dredge is scheduled to arrive in May and with the backlog, dredging will start immediately. The dredged material will be placed in containment basins on shore, which trap the sediment and allow the debris-free water to drain back into the waterways. The process is permitted through the U.S. Corps of Engineers, Illinois Environmental Protection Agency and IDNR. “We have a small recreational boat launch, about 10-feet deep and close to shore that gets a lot of sand build up. 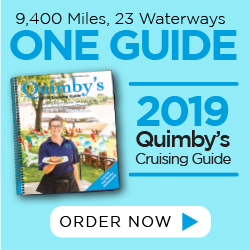 Every two years we need to dredge out that sand and we decided instead of paying contractors we’d purchase our own,” Bruce Stolman, economic development director of the City of Whiting, said. The City of Whiting sits on Lake Michigan and is adjacent to Chicago, so it is a busy boating area. “We have a lot of weekend boaters and we have a boat club on-site and a private club that leases space from the city. Access to the lake is a main asset for our community that we like to keep open,” Stolman said. The city dredges the material and pumps it through the harbor using 300 feet of pipe. The material is placed in geotextile bags in a nearby parking lot where the sand is dewatered. A polymer is added to the lines to precipitate the fine sands out. The water and fine sand then runs back into the lake. A silt fence is placed along the parking lot to capture anything that might come from a break in the bags. The city purchased the dredge in the spring of last year and did some work in the fall and spring of 2018. Stolman said the work took about forty hours and required one person to man the dredge and another on shore to operate valves on the manifold bags. The set-up of the dredging project requires extra people to put together the bags, hose floats and pipeline, but the work only takes about a half day. He continued that the only issues are that the dredge is slower in rocky areas, and that the work is weather dependent since wind and waves will prevent the dredge from going out. “We like having our own dredge because we don’t have to rely on other’s schedules. Often contractors can’t meet our timing needs. We can dredge when it suits us when we have personnel or an emergency like a bad winter where lots of sand landed in the harbor we can dredge when we want. Gives us lots of flexibility,” Stolman said. He also commented that surrounding communities have many marinas and boat launches and the City of Whiting has offered to lease their dredge to these municipalities.